Nothing compares to my Mama’s seafood gumbo. So far, I have not tasted one as good as her’s. That’s why I’m so excited to share her recipe with you in hopes you give it a try and become as gumbo-happy in this cold weather as I am! Brrr! Now, I know there are a lot of you who have your own fabulous gumbo recipe or way of cooking one either written down somewhere or engraved on your heart. You may even have a trustworthy gumbo making source that you heavily rely on. That’s great, but this post is for beginners and those who have shied away from gumbo making thinking it’s difficult. It isn’t. So let’s begin at the beginning where most Cajun dishes begin. On my annual Christmas visit to Mama’s this year, she graciously walked me through this adventure of seafood gumbo making. It had been a while since I experienced cooking one so I appreciated the guidance. First, she said I needed to make a dark roux. Darker than the roux I make for chicken gumbo while using more flour and oil. I watched attentively, constantly stirring not to let it burn. The outcome was a beautiful dark rich color similar to chocolate fudge. Do you see the resemblance? This reminds me of my good friend’s story she tells of her coming home from school and finding what looked like fudge on the kitchen counter. She quickly discovered it wasn’t after a spoonful of the surprisingly bitter taste hit her tongue. That made her Mama laugh! The next ingredients to this delicious gumbo are the chopped vegetables and seafood stock. Stock can be purchased in the grocery store or made by using discarded seafood shells. The broth freezes well and I was so glad to have a stash in my freezer to add to the pot. After the roux and stock have simmered together it’s time for the seafood. Don’t forget to make sure it’s free from small pieces of shell that sometimes get left in the meat. Since the shrimp takes a little longer to cook they are added to the pot first with the seasoning to simmer then the crab claw meat and oysters join the shrimp to cook for a few minutes longer. Some Slap-Ya-Mama Cajun seasoning and a little more salt add just the right amount of flavor to the gumbo. Lastly, the chopped parsley and onion tops are thrown in and given a stir before the gumbo is served over a bowl of rice. See how easy it is? It may be different from the way you are used to cooking, but it’s really a simple dish. Cajuns have been making gumbo for years and not much has changed. 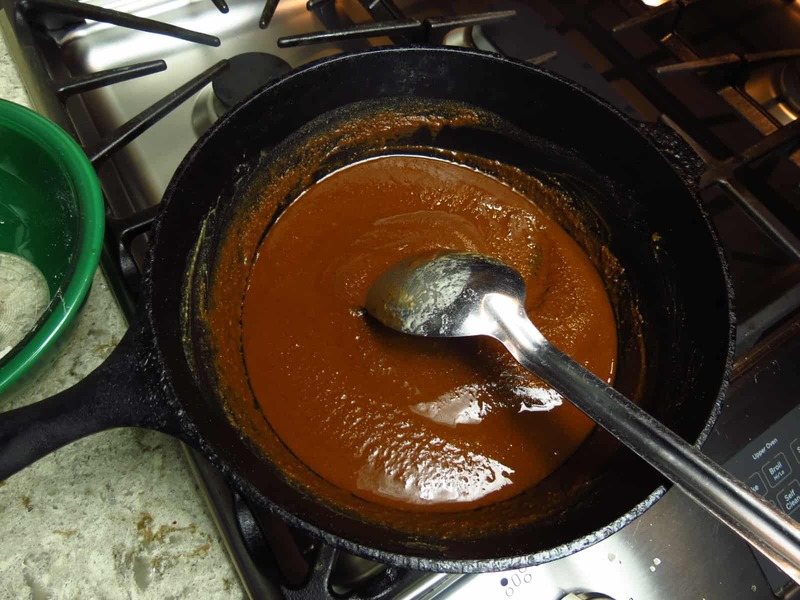 It’s still a basic dish made with a roux or okra, some onion and other vegetables, water, meat, and seasonings. You can usually use whatever you have on hand and still make a tasty meal. Besides, every gumbo tastes different, they’re never quite the same. That’s half the fun of it, getting to be creative. The other half is eating it. We begin this classic seafood gumbo with an extra dark roux then intensify the shrimp, crab, and oyster flavor with a rich seafood stock simmering this gumbo to a delicious end with fresh chopped parsley and green onion tops for added flavor and color. Cook the oil and flour in a heavy black cast iron pot over medium heat stirring continually until the roux is a dark-chocolate, fudge color. Add the onions, celery, and pepper and cook for 10 minutes, adding the garlic during the last few minutes of cooking time. Next, add the seafood stock and simmer on medium heat for 30 minutes. Add shrimp and seasonings then cook on medium-low heat to simmer for 10 minutes. Add crab and oysters and cook for 5 minutes more. It is time to taste the juice and adjust the seasoning if needed. Stir in parsley and onion tops and serve over cooked white rice. Make sure seafood is free of shells, sand, and/or grit. Extra salt may not be needed if you are using another seasoning blend besides Slap-Ya-Mama. The oysters, parsley and onion tops may be optional. If you don’t want to add them this will still make a tasty pot of gumbo.